A member of the full-time faculty of the Pentecostal Theological Seminary since 1982 and the Director of the Centre for Pentecostal and Charismatic Studies at Bangor University (2007), Professor Thomas has been honored for his work in New Testament scholarship by election into membership of the Studiorum Novi Testamenti Societas and his appointment as the Clarence J. Abbott Professor of Biblical Studies at the Pentecostal Theological Seminary. He has published articles in several leading international journals devoted to study of the New Testament including: New Testament Studies, Novum Testamentum, Zeitschrift für die neutestamentliche Wissenschaft, and Journal for the Study of the New Testament. He has authored a major study entitled Footwashing in John 13 and the Johannine Community, published a collection of his essays for the church, Ministry and Theology: Studies for the Church and Its Leaders, written a significant monograph on healing entitled The Devil, Disease, and Deliverance: Origins of Illness in New Testament Thought, authored a brief study on John 13-17 entitled He Loved Them until the End: The Farewell Materials in the Gospel according to John, written a commentary on 1 John, 2 John, 3 John, published a collection of his studies in The Spirit of the New Testament, and recently completed a major commentary on the Book of Revelation entitled, The Apocalypse: A Literary and Theological Commentary. 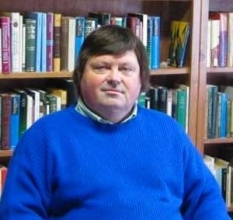 Professor Thomas serves as editor of the Journal of Pentecostal Theology (Brill), the Journal of Pentecostal Theology Supplement Series (Deo), and serves as General Editor of the Pentecostal Commentary Series (Deo). Strongly committed to parish ministry, he has served as Associate Pastor of the Woodward Avenue Church of God in Athens, Tennessee since 1981. Professor Thomas has been a Guest Lecturer or Visiting Lecturer at a variety of educational institutions on five continents. He was named Alumnus of the Year by Ashland Theological Seminary (1992) and by the Church of God Theological Seminary (2004). Dr Thomas served as the President of the Society for Pentecostal Studies (1997-98). He is married to Barbara and they have two daughters, Paige Thomas Scaperoth and Lori Thomas Brown, and two sons-in-law, David Scaperoth and Chad Brown.